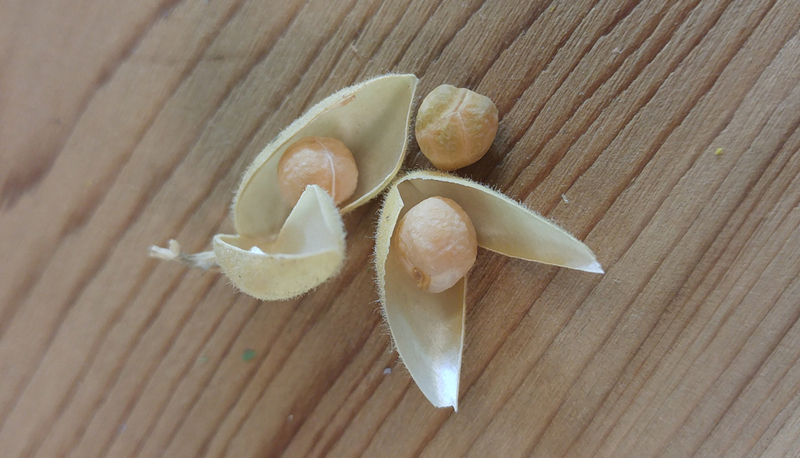 Chickpeas come in easy-to-peel pods. When I heard that the United Nations named 2016 the International Year of Pulses, it motivated me to grow pulses, but first I had to learn what pulses were. 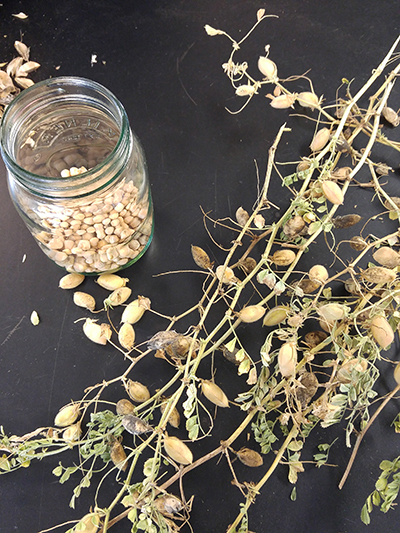 Pulses are a type of leguminous crop that are harvested for their dry seed. Examples include dried beans, lentils, and chickpeas. They are packed with nutrients and have a high protein content, are low in fat and rich in fiber. 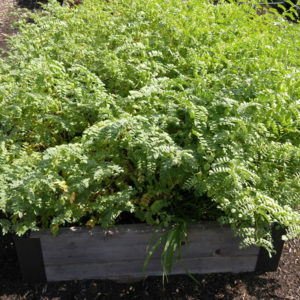 They also enrich the soil, are water efficient, don’t need much fertilizer, and can be stored for long periods of time. In other words, they are great crops to feed the world! I wanted to be a part of it, so I thought I’d give it a try. I wasn’t able to find a packet of chickpea seeds, so I used the seeds from a package of Garbanzo Beans Sprouts from Botanical Interests. I sowed the seeds in a raised bed in late spring, right around the time of our last frost date. Before sowing, I amended the soil with our granular organic fertilizer. You may read other posts that say they need a long growing season, but don’t let that stop you. Our season is short here in northern Vermont, and the plants had plenty of time to grow. The seeds germinated easily and the plants grew well with little more than sunshine, occasional watering and admiration. They did not need staking and had pretty little white flowers in spring that turned into cute green pods throughout the summer. The peas inside are tender and edible, and taste a bit like edamame. Because I wanted to save most of them for dried chickpeas, I tried not to eat them all. By late summer, the plants began to turn brown and dry out — this is supposed to happen. After a few weeks of dying back in the garden, I harvested the plants by cutting them off at the soil line, and brought them inside to dry out completely. It’s easy to strip the dried pods from the branches and open the husks to reveal the little treasures. It is a bit time consuming, so I enlisted the help of two coworkers, and we had fun while we chatted and peeled. From a 3’x 6′ raised bed, I got about 3 cups of dried chickpeas, which need to be soaked before cooking. Not a huge harvest, but enough to add to a few delicious soups or to make fresh hummus this winter. Plus, the joy of saying, “I grew these myself” makes it all worth it. What I Really Want for Christmas: a Worm Composter! You can get garbanzo bean seeds year round at http://www.palousebrand.com, they are Kosher and Non-GMO project verified. We don’t care at all for chickpeas, but love cowpeas. The seeds to those are hard to find too. We are in Indiana and cowpeas are a southern crop so maybe that is why. I have seen them catalogs. They are good fresh or dried. Cook them with ham, bacon or hamhocks. and from Territorial Seed Company. I saw a cooking show and they were using green chick peas. How would you accomplish that? Don’t dry them on the stems? My husband is the chick pea King! He will take a can of them, heat them, then add olive oil, and fresh ground pepper and a chunk of bread…..that’s lunch! He’s Sicilian born and raised and loves those little morsels any way he can get them.